Virgin Media has apologised in advance to thousands of customers that live in London for delays that will be caused by restrictions on digging up the roads on the Olympic Route Network. In a postcard apologising to users on the route, Virgin Media explains that any necessary repairs to its cable will take 'longer than usual' between March and September, because it will be limited on what it can dig up. "Thanks to the team's hard work. It's really unlikely that you there'll be a problem with your service," wrote VM. "If it turns out that we need to dig under your roads, it might take us a bit longer than usual...we're really sorry for any inconvenience this causes," the note continued. The Olympics is inevitably causing some major gripes to those in the areas likely to be affected, with already overloaded transport links likely to be hit hard by the Games. 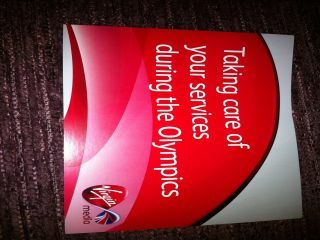 Virgin Media is, in fairness, making sure that it is being clear about a potential problem, rather than predicting one. But here's hoping that your cable doesn't go down in a whopping seven month period, or you could find yourself listening to the 100m final on the radio rather than watching it in HD.